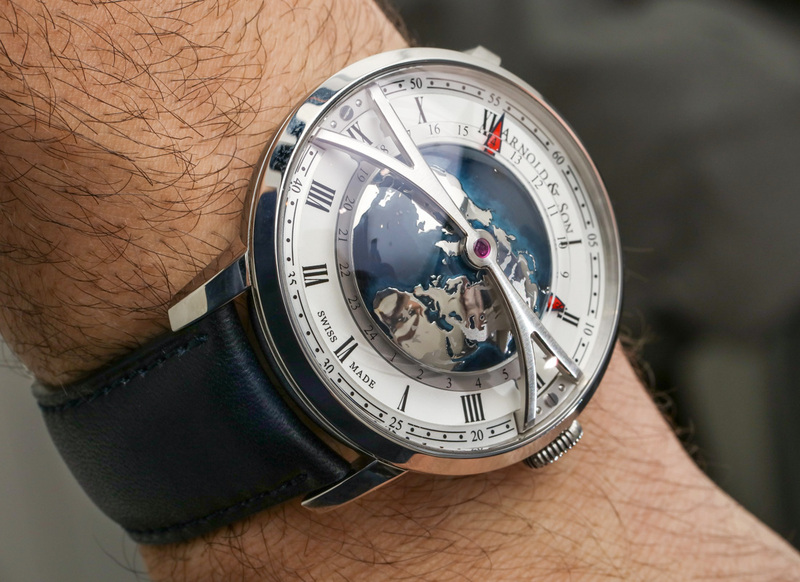 It’s only fitting that with travel as one of the world’s fastest-growing sectors this year, that we take a quick cross-examination of two types of prominent GMT watches this year: we’ve seen plenty of the travel companions, the tool watches that keep you on schedule in far-flung corners of the world. Then there are purely aspirational pieces that inspire wanderlust – like an artfully crafted globe for every pocket-sized map that never leaves the inner pages of your passport. 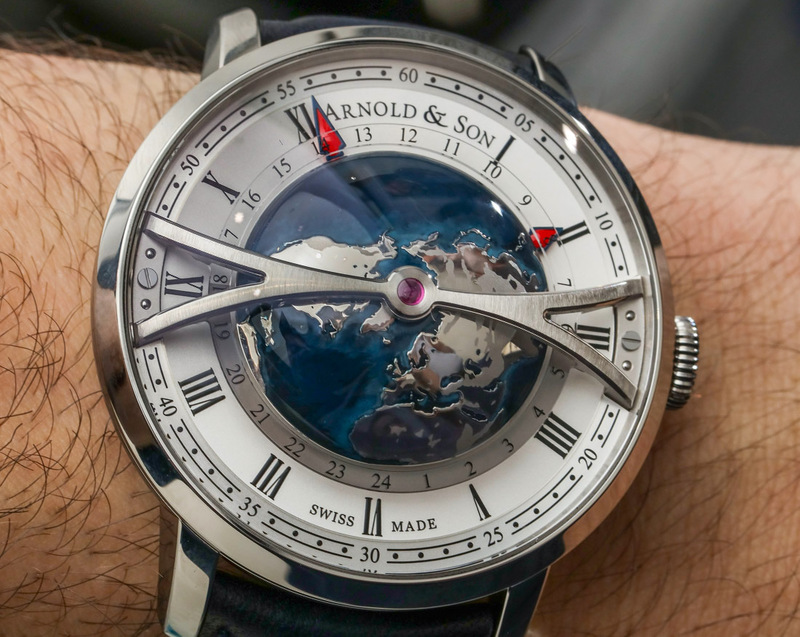 The Arnold & Son Globetrotter is firmly in the latter camp, exhibiting a gorgeous, three-dimensional satellite view of the Northern Hemisphere from the North Pole in the center of the dial. Is it practical? Hell no. Is it one of the year’s best worldtime-themed art pieces? Absolutely. Before we get too deep in the nitty-gritty, it’s worth pointing out that the watch is firstly inspired by – and actually manages to evoke the design language of an original marine chronometer from the early 19th century. If you’ll remember, these were the large shipboard clocks that didn’t just tell the time, they were unique navigational instruments used to determine longitude, enabling a ship to sail safely from one location to another. Granted, it’s not quite as large as a proper marine chronometer (it’s only 45mm wide, after all), but it does certainly look as though a larger version of itself could be right at home in James Cook’s quarters, deep inside HMS Resolution. Though small (only by comparison to an actual marine chronometer), in reality, the Globetrotter is anything but, once on the wrist. Its stainless steel case wears a full 45mm by 17mm thick at the convergence the twin arches framing the dial, but as we’ve come to appreciate with watches like this, the wearing experience is not one of everyday practicality, but rather an appreciation of detail. And hoo boy, are there details galore, throughout the center globe relief. The globe gets its start as a brass disc, which is then deeply etched, sandblasted, and polished to bring out the Northern Hemisphere’s land masses, and create a surprising degree of texture and depth to contrast the bodies of water. But the real star here is the Pacific and Atlantic oceans, which are rendered in multiple shades of hand-applied blue lacquer, representing the different ocean depths, and yielding a beautiful layered effect that’s only enhanced by the three-dimensionality of the globe itself. 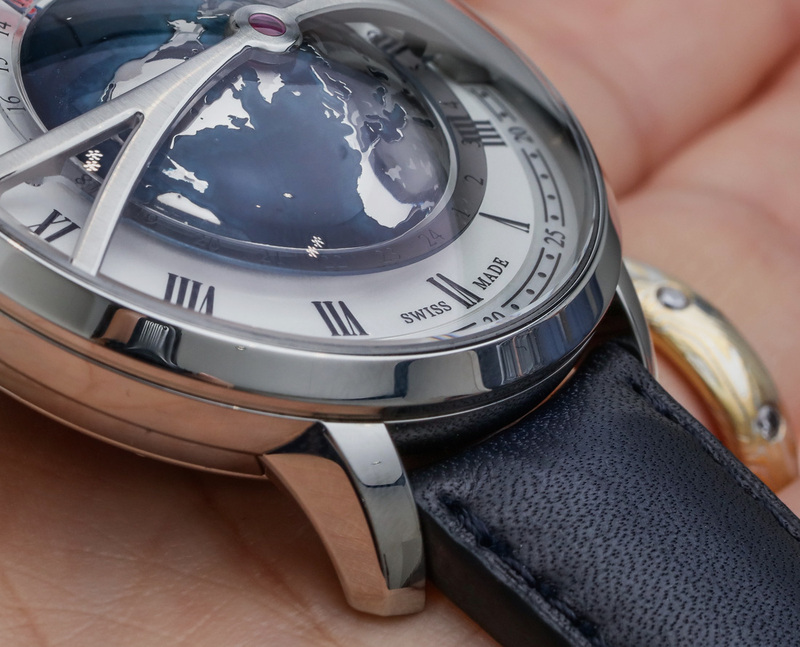 The sheer mass of the globe itself is a large part of the watch’s overall appeal. In fact, Arnold & Son suggests it’s “one of the world’s largest rotating 3D world time displays” on a wristwatch. 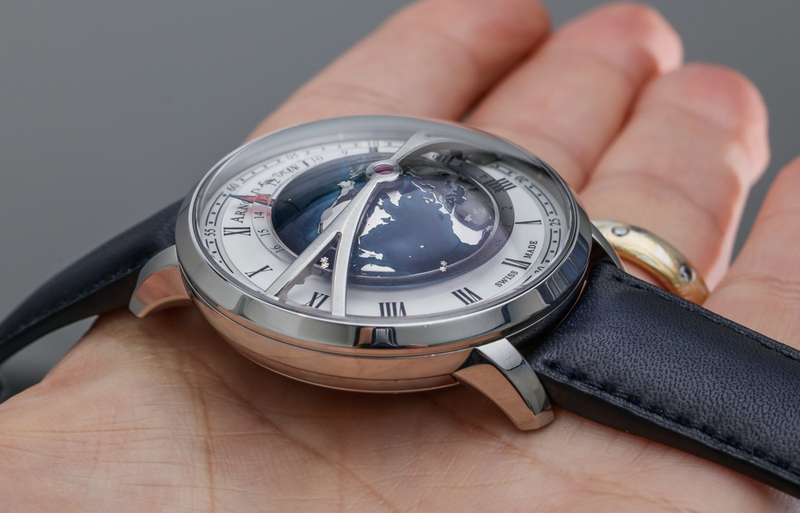 Granted, it’s not exactly a hotly contested category, and the description itself is a bit misleading, because the Globetrotter exhibits a semi-flat, half-sphere rotating on a single horizontal plane, whereas other ‘rotating worldtimers’ like this masterpiece from Greubel Forsey use a truly three-dimensional rotating sphere (albeit, a much smaller one) to get the job done. 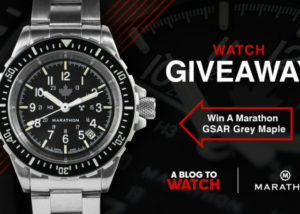 The Globetrotter is powered by the A&S6022, a beautifully-finished caliber that’s exclusive to this particular watch. In a manner of speaking, this movement behaves as a ‘true’ traveler’s GMT should – with a 24-hour time display and an independently adjustable, red lacquer-filled hour hand. 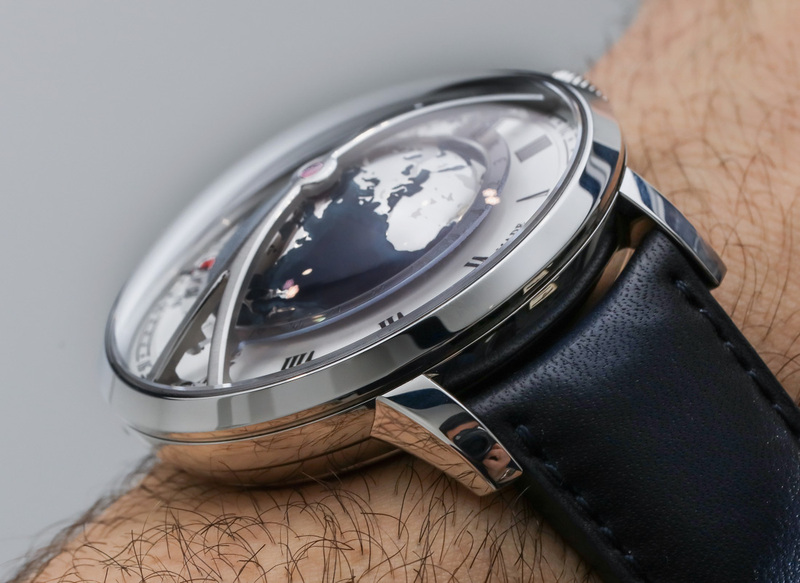 But the aim of a true worldtimer as Louis Cottier once envisioned, was to make all 24 time zones represented on the dial immediately legible and easily calculated at a glance. So if it’s 8:00am in Los Angeles, how quickly can you make out that it’s 4:00pm in London? Unfortunately, without reference lines for each time zone, or a singular cardinal marker at least for GMT (London) that can be tracked whilst the globe rotates around the dial, you’re left doing a bit of guesswork between the land masses represented on the rotating globe and which time zones they might correspond to across the 24-hour ring. At least it’s real pretty though, right? 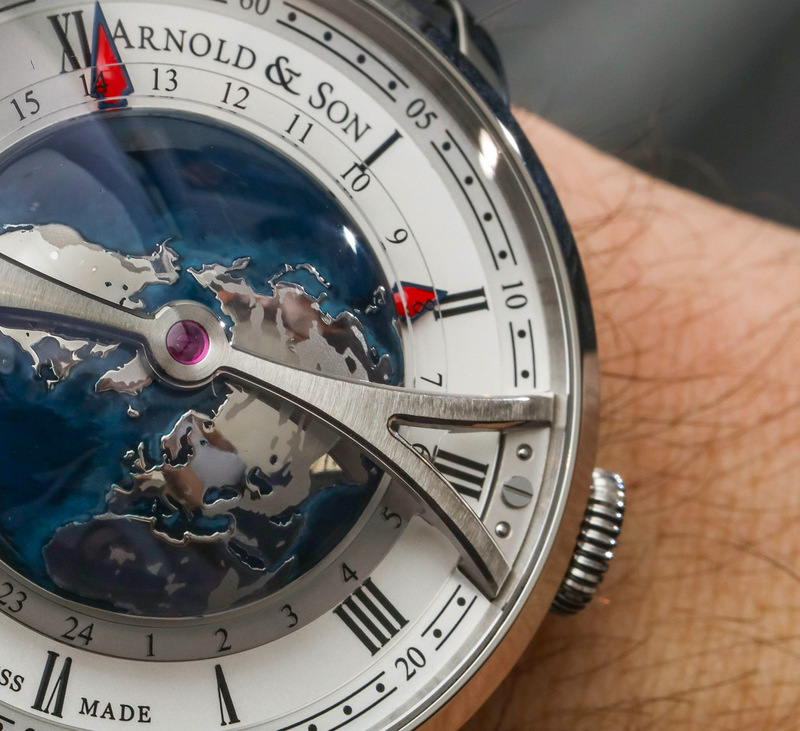 Rendered in a stainless steel case, the price of the Arnold & Son Globetrotter is $16,995. For more information on availability, head over to arnoldandson.com. 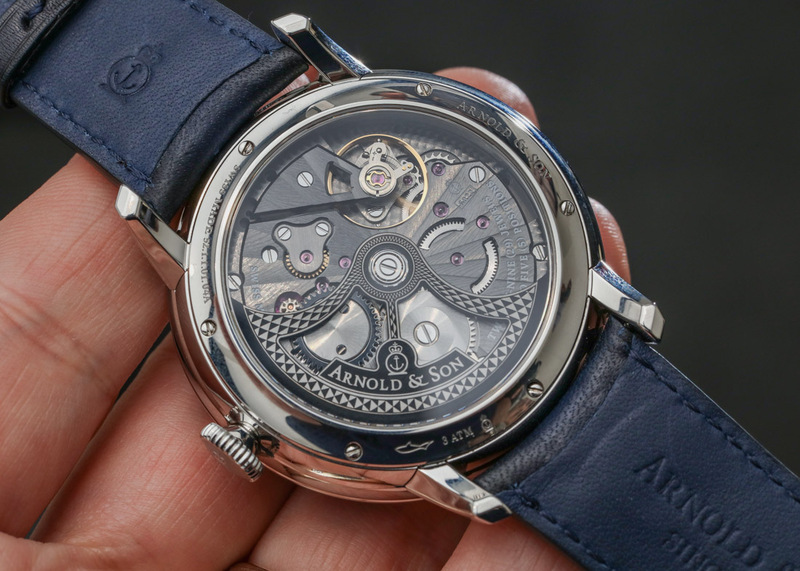 I wish it had a seconds hand and were not (over-)priced at a typical Arnold & Son price. In any case, it is clearly just a toy – a shame as I like the half-globe a lot. Lovely rendering of the globe, without question. Massive display, and unfortunately a somewhat redacted experience due to the massive bridge holding it. The hands: that red is lacquer? We’re sure? Seems like a strange choice, and I dont appreciate how it a different colour than the large and very conspicuous synthetic ruby dead centre: those hand insert could have very easily been the same material, given the same transluscent effect, and matches the rest of the watch for a more complete appearance. Christophe Claret does it, and while his shop is certainly in a higher bracket, I doubt it’s just because of his handsets. 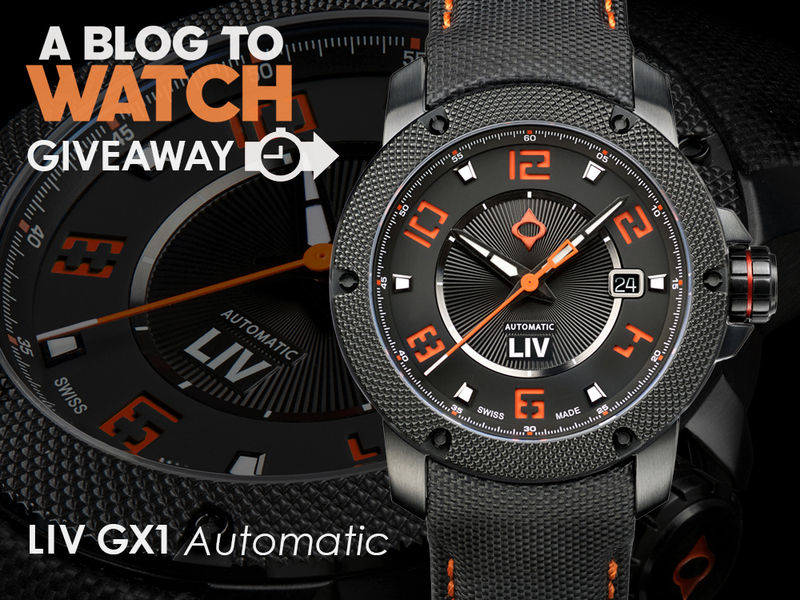 Would love to see how it looks on the wrist.